Update: The below story was initially reported by Jon Carroll of the Henry County Report, was circulated on social media by a number of prominent journalists, as well as the Southern Poverty Law Center, and was eventually aggregated by a number of news organizations including, obviously, Jezebel. While there is no new information to explicitly disprove the claims of the article, a piece from Slate’s criminal justice reporter Leon Neyfakh certainly calls it’s claims into serious question. The primary issue: none of the anonymous documents Carroll published with the article incontrovertibly prove the main thesis of the article. I called Carroll yesterday, and he told me he has more than 800 documents in his possession and will be releasing them slowly over time, in accordance with agreements he has made with his confidential sources. When I told him I didn’t think the documents he had posted so far provided enough evidence to base a story on, he told me he understood, but that his primary goal wasn’t to convince readers like me, but rather to get the Justice Department to investigate. This is fair enough; the Henry County Report is not really a traditional newspaper, as I and I imagine many others assumed it was. On Thursday afternoon, SPLC retracted its initial tweets. 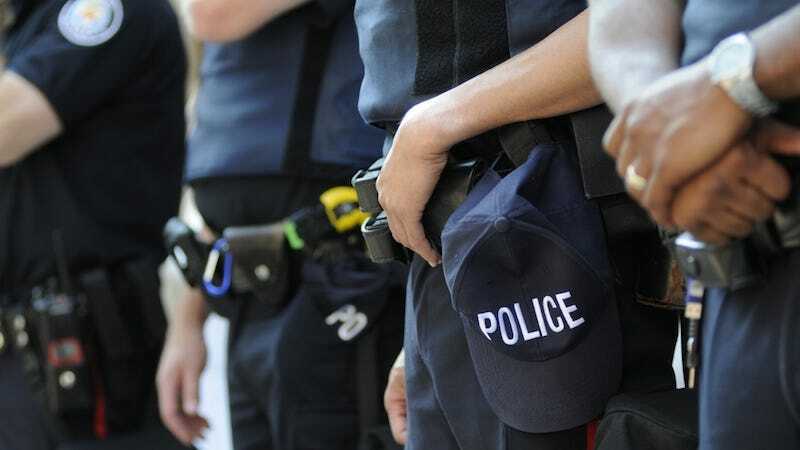 A group of up to 12 police officers in an Alabama county planted drugs and weapons on young black men for years, according to a report from the Alabama Justice Project. These officers were part of a narcotics unit in the Dothan Police Department and were supervised at the time by current Dothan Police Chief Lt. Steve Parrish as well as Alabama’s Asst. Director of Homeland Security Sgt. Andy Hughes. The men reportedly were also members of a neo-Confederate organization that has been designated a hate group by the Southern Poverty Law Center. Appallingly, the group’s activities were revealed by an Internal Affairs investigation—an investigation that was then, even more appallingly, covered up by District Attorney Doug Valeska. Beginning in early 1996, the Dothan Police Department received complaints from black victims that drugs and weapons were being planted. Specifically young black men who had clean records were targeted. Police Chief, John White, allegedly instructed senior officers to ignore the complaints and they willingly complied. ..
All of these cases involving planted drugs and weapons were subsequently prosecuted by District Attorney, Doug Valeska, despite the written allegations by police officers that the evidence was planted. Never was any such information shared in the discovery process with the defendant’s attorneys. We have been advised that each of these are considered felonies committed by the district attorney. The false arrests made by these officers reportedly total in the “hundreds,” and men are still incarcerated on these false crimes. According to the Report, the incriminating documents have been shared with the U.S. Department of Justice Civil Rights Division, and with the lawyers of the wrongly convicted.